In our third Super Mario Maker-related update in a row, we are pleased to announce that today we released Super Dude Bros. II Chapter 1-2: There Will Be B.R.Oil, the oft-requested followup to Super Dude Bros. II Chapter 1-1: Dawgs of War. 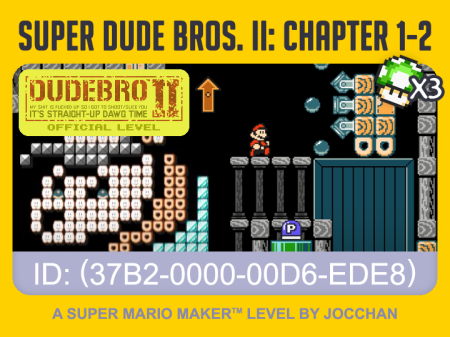 This level, whose ID is (37B2-0000-00D6-EDE8), is loosely based on the second half of the first chapter of Dudebro II, with our beloved plumber Supah Mariobro following Dudebro’s steps through a mysterious oil pipeline facility in Alaska, up to the first boss fight (of course adapted to Mario gameplay) against a familiar character. As the level picks up right where Chapter 1-1 ended, it’s highly recommended to play the two stages in order, possibly one after the other. Both feature a fair share of secrets, such as three hidden 1up mushrooms in each. Unlike 1-1, Chapter 1-2 may get a bit spoilerish in a few instances. Not everything shown here is actually going to be part of the game, but some elements could be similar. For this reason, especially if you’re sensitive about spoilers, play at your own risk! This entry was posted on Sunday, October 25th, 2015 at 12:20 am	and is filed under Main News.